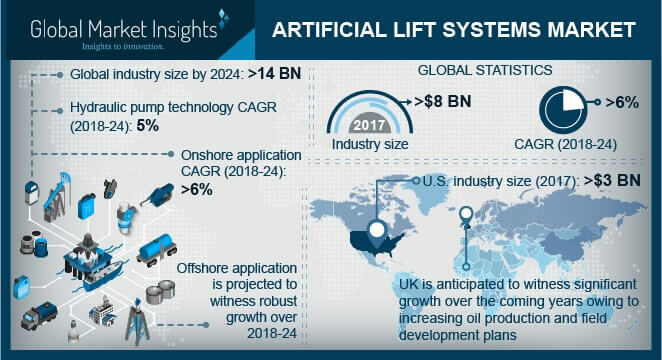 Artificial lift Systems Market size is set to exceed USD 14 billion by 2024; as reported in the latest study by Global Market Insights, Inc.
Increasing number of marginal and stripper wells coupled with the rising demand of crude oil will drive the artificial lift systems market size. In the U.S., the Energy Information Administration estimated around 380,000 stripper wells compared with about 90,000 non-stripper wells in 2015. As per the Artificial Lift R&D Council, around 80% of the wells in the U.S. are stripper wells, with majority of them installed with sucker rod pump. The U.S. artificial lift systems market was valued over USD 3 billion in 2017. Ongoing E&P spending coupled with increasing shale exploration will enhance the business growth. As per the EIA, 44 onshore oil companies have increased its capital expenditure by 72% between 2016 and 2015 in the country. The U.S. DOE has estimated 89 BBL of untapped oil across onshore wells, which will further enhance the product adoption. Offshore artificial lift systems market will witness a strong growth owing to the ongoing expansion of deep-water projects. In 2018, the U.S. Federal Government has unveiled five-year plan which includes expansion plans of offshore drilling, targeting Atlantic, Pacific and Arctic oceans. Abundant resource availability coupled with increased offshore investments will further complement the industry outlook. Hydraulic pump ALS market is projected to witness gain of 5% by 2024. Ability to reduce the resistance coupled with less work requirement of downhole pump will augment the industry growth. These pumps can be circulated out of the hole for repair with minimum intervention cost, which will further boost the product penetration. Operators’ focus toward unconventional wells to meet the growing demand of crude oil will propel the global artificial lift systems market share. Ongoing government plans and strategies to boost crude production along with increasing number of mature fields will further stimulate the deployment of these systems. In 2018, the Government of Iraq announced its target to produce 7 million bpd of crude by 2022. Technology advancements to provide cost effective solutions for low-rate liquid-loaded gas and gas-lifted oil wells will complement the gas lift systems market growth. Innovations including the development of smart gas lift systems to offer rig-less installation, minimized manual intervention, reduced OPEX, increased visibility & data logging, decreased flowline backpressure and multi-well control will further encourage the product adoption. Growing primary energy consumption coupled with escalating focus toward sustainable resources to extract crude oil and gas will foster the Iran artificial lift systems market. As per the British Petroleum in 2016, the primary energy consumption of the country increased to 266.5 Million tonnes oil equivalent, when compared with 237.4 in 2013. Key players operating across the ALS market include Schlumberger, General Electric, Halliburton, Borets Co. LLC, Weatherford, JJ Tech, National Oilwell Varco, Dover Corporation, BCP Group, NOVOMET, Aker Solutions, and Occidental Petroleum.